First things first. Peep this chart. 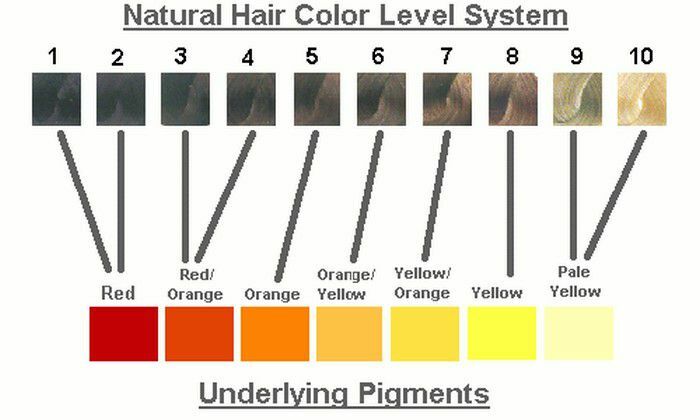 When formulating hair color, you must take into consideration the underlying pigments and how they will act. Many stylists throw the term around "use it, or lose it" when referring to underlying pigments. This is because you will need to determine if the underlying pigment will help or hurt your desired outcome. If you are looking to achieve a cool beige blonde on natural level 6 hair, then you would lose the underlying pigment, and work to cover up the warmth that will inevitably come out in the hair when you lighten it. Keep in mind that you'll generally have to be aware of underlying pigment when you are lightening two shades or more from the natural hair color level. You won't have to worry about it when going darker than the natural level, as there will be no threat of the color appearing or affecting your formula. Hair color is a manifestation of light reflecting off of melanin, or pigment molecules, in the cortex of the hair. There are two types of melanin in the hair: eumelanin, which has two sub groups, black and brown, and pheomelanin, which is red or orange. The presence of these pigments and how much is present is what causes different shades or “levels” of hair. Hair color is measured by professionals by level to show the amount of melanin present. Varying percentages of melanin of both types can also affect the “tone” of the hair. Tone is used to describe a color as either warm or cool. Identifying colors as warm and cool is as simple as trusting your eyes. If you see fire, lightness, orange, red or yellow tones, this is a warm color, regardless of level. Pheomelanin’s presence causes hair to appear warm, red, orange, or golden. Blonde hair is defined as hair with a small percentage of pheomelanin. 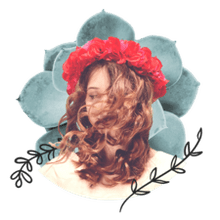 The beauty of hair color is that it's basically a set of rules, and though there are a lot of them, if you follow them correctly, you can usually determine what the final results will be. The other great thing about hair color, is the fact that if you do mess up, there is almost always a fix. Your client might not be too happy but you can handle them, right?